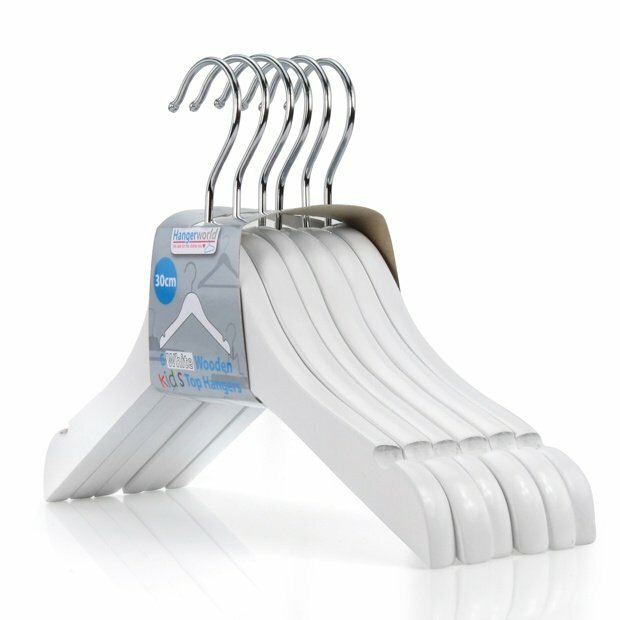 Children’s premium wooden top hangers, made from long-lasting hard maple wood, with a brilliant white finish. A smooth surface prevents your children’s clothes from being snagged, which causes loose threads and quickens garment deterioration. Upper shoulder notches enable clothes with garment loops and straps to be hung easily without slipping off. Completed with a 360°, polished chrome swivel hook that allows you to position the hanger in any direction and neatly align clothes. Suitable for hanging tops, jackets, coats, baby-grows, and dresses etc. Perfect size for baby, infant and toddler clothing. Very high quality products. Would definitely buy again.